A year and a half ago I wrote what I thought would be the end of writing about Icelandic volcanoes for quite some time. Reality obviously caught up with me, and I had to write quite a few more articles. The Woolly Mammoth was not intended to be left alone, my idea back then was to revamp it on an annual basis as new scientific data came to light, and also due to the not so small fact that Icelandic volcanoes tend to do interesting new things quite often. So, not only had the Woolly Mammoth grown stale, it also needed to be redone. I was never quite satisfied with how it had turned out. To put it mildly, it was too much of a mammoth and contained too little wool. Or in other words, it was too long and could quite honestly do with a bit of fleshing out for the more interesting volcanoes. So, in the 2018 version I will cut it up into far more manageable chapters. The chapter part comes out of my idea to slowly flesh the entire thing out into a proper book sometime in the future. And books do quite nicely with chapters. Instead of doing it in alphabetical order, or a chapter per volcano, I will this time do it a chapter per main volcanic belt. In the 2018 Woolly Mammoth there will be a few new volcanoes, and some volcanoes will have additional information, and for others the risk estimation system I developed for the 2016 edition will be changed. Below I have assigned a risk value for every volcano to erupt, ranging from 1 to 5. This risk level is of my own device and is based on historical eruption frequency and current level of activity. The risk is purely based on how likely the volcano in question is to erupt in the next ten years, the risk number is not to be viewed as a sign of how dangerous an eruption might be. The risk numbers are percentage based and grouped, so for any volcano the number would be anything in between the given numbers. The reader would also be well advised to remember that sometimes a volcano may change its pattern and behaviour radically. See these numbers as a handy way of discerning between the volcanic deadbeats and the volcanoes that are likely to blast off soon. 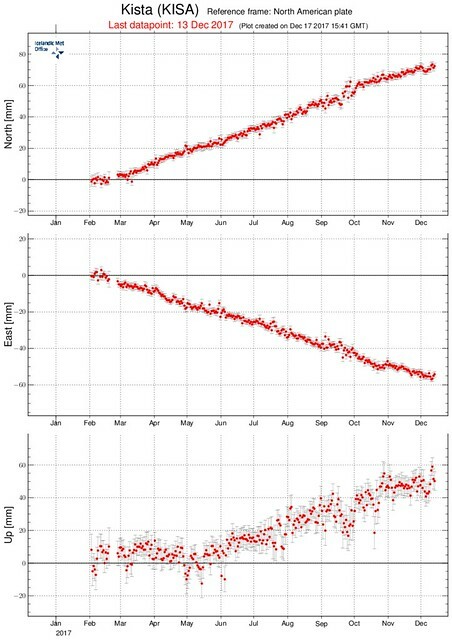 The foundation for the total of the numbers adds up to the eruption frequency of Iceland. And that is between 3 to 7 years on average. During heightened activity as the Icelandic Mantle Plume goes into overdrive that frequency is 1 eruption every 3 years, and during slower times it is 1 eruption per every 7 years. So, the individual volcanoes might be off somewhat off, but the value for all of Iceland should be accurate. Some of you may notice that I have added two more volcanic belts in the Woolly Mammoth Guide to Icelandic Volcanism. The Eldey – Geirfuglasker Volcanic Belt and the Vestmannaeyjar Volcanic Belt are not normally used in the literature. The reason that I think it is warranted, is due to that the areas express volcanism that is sufficiently different to separate them from the mainstream volcanic belts and zones. Traditionally the Eldey – Geirfuglasker volcanic systems are counted as either part of the Reykjanes Volcanic Belt or the Reykjanes Ridge, part of the Mid Atlantic Rift, but the eruption styles and frequency are so different that it warrants to be set apart in my view. Seismic map of Iceland using IMO data from 1997 – April 2017. Depth by colour gradient. Map by Andrej Flis. Surprisingly little is known about the Reykjanes Ridge beyond Geirfuglasker and Eldey. What we do know is that it is the part of the Mid Atlantic Ridge where it connects to Iceland. The lavas are predominantly unaltered MORB (Mid Ocean Ridge Basalt), unaffected by the mantle derived basalts of central Iceland. The eruptions are also closer related to normal ridge spreading types in that they are driven solely by the force of plate tectonism. Or in other words, as the plates are pulled apart magma will rise into the cracks and faults, and sometimes this magma will overflow and erupt as lava. This in turn creates a localized upwelling of warmer upper mantle material lifting the spread centre causing a distinct ridge to form. In the case of Reykjanes Ridge it is erupting more than the rest of the Mid Atlantic Ridge, so a broader and less deep part of the ridge has formed. It is unclear why this is happening, but it is most likely related to the larger volcanic presence of Iceland itself. Seismic map of Southern Iceland. 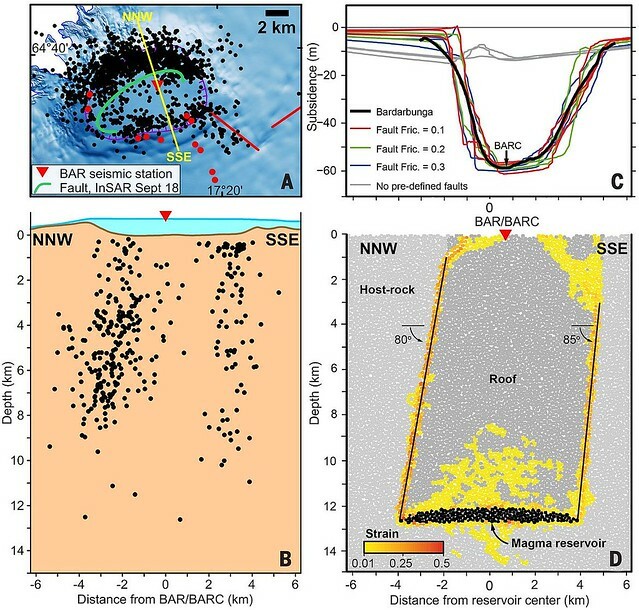 There is an apparent aseismic zone between the MAR and RR (indicated by a dashed line) and also a disjointed seismic area that points further East from the MAR (second dashed line). There is a deep area of seismicity indicated at the (?) where this Eastward offshoot of the MAR intersects with the SISZ (possible failed rift zone?). The embryonic rift zone of Vestmannaeyjar is indicated by the deep activity at (V). Data by IMO, map by Andrej Flis. The Reykjanes Ridge tapers off to the SSW and broadens as it continues towards the NNE until it reaches the Eldey-Geirfuglasker Volcanic Belt (EGVB). What little data there is suggests that eruptions occur frequently along the Reykjanes Ridge, but that it almost never causes any concern to human life. It may though affect ships passing over an active eruption, and potentially an eruption may cause a ship to sink due to loss of buoyancy from actively degassing vents during eruptions. There seems to be evidence that the Reykjanes Ridge is yesterday’s news. The Mid Atlantic Ridge is now slowly moving to a new spread centre that will connect the MAR to Iceland. We will return to this when we come to the chapter about The Vestmannaeyjar Volcanic Belt (VVB). Eldey and Geirfuglasker are two NW-trending fissure swarm volcanoes that form a larger double system that is separated in behaviour from the Reykjanes volcanism and the Reykjanes Ridge volcanism. What sets them apart is that they are the intersection between the Reykjanes Ridge part of the Mid Atlantic Ridge (MAR) and the Reykjanes Volcanic Belt (RVB). As such they are not true MAR-volcanoes, and not true Icelandic volcanoes either, but instead form an intermediary type of volcanism. But, compared to the Reykjanes Ridge volcanism we can here clearly see and talk about two discrete volcanic features that anyone will recognize as a volcano. In the next chapter we will deal with the Reykjanes Peninsula volcanism as we finally are ready to step unto the shores of Iceland. Will allways read your Iceland articles with great interest! The article will soon be updated with a couple of Andrejs fantastic plots. I have a question regarding how big eruptions in Iceland can be. The big rifting fissure flood basalts can be up to about 30 km3 in size, and lava shields can be up to almost twice as big, but has there ever been really truly huge lava flows like the supervolcano sized 700 km3+ lava flows from some other flood basalts? I remember reading that you said a big part of northern Iceland west of krafla and theistareykjarbunga that is the tufted remnant of the biggest volcano in Iceland, and that it has trap formations which to me indicates some pretty big lava flows. It is important to remember that when we talk about large Icelandic eruptions we are talking about events that have taken place in the last 12 000 years (Holocene). A few of those reach the circa 50km3 range, or even slightly larger. Those are almost all combined hrauns that end up with shield formations. The largest known hraun-only is Thjorsahraun at 35km3. Normal large eruptions would be the rifting fissure eruptions of Lakí, Veidivötn, Eldgjá and the likes up to 20km3. There is though a class of eruptions that we could call the “once in 100 000 years”. Just because they have not happened during Holocene, it does not mean that they are not possible. And those are at around 100 to 150 km3 per flow. I would though state that the risk of something of that magnitude is pretty low. On a totally different class, we find also the possible ring-faulted rhyolite eruption of Torfajokull circa 20km3, around 70.000 years ago, that deposited 5cm of ash towards Carl Scandinavian home. It was a truly mammoth eruption. But yes, the area west of Krafla (and west of Akureyri) have remants of what seems to have been a trap-formation, and also evidence of possibly the one thing closest to a VEI7 in Iceland. I long forgot the name of that extinct volcano, but it was that area, and near the north part of Hofsjokull. When was the last so-called ‘100,000 year eruption’? Im guessing it was probably more than 100,000 years ago or it has been buried under new lava and destroyed by glaciers in the last ice age. Maybe when the ice ages end altogether (probably not going to happen until Antarctica forms a shallow connection or land bridge to south america again), Iceland might smooth itself out and become more like the rift valley in Ethiopia. If the holocene leads to all ice melting for the next 200,000-300,000 years maybe this might start to happen anyway. On a slightly different topic, is it possible for hekla to do a big rifting fissure eruption? Its had some big historical eruptions and on this map (http://jardfraedikort.is/) it seems to have a significant fissure swarm that goes up to the valley where the thorsja lava went through, and some historical eruptions along it, and there is a pretty big holocene lava field around it called ‘keldnahraun’. I dont think its next eruption will be like this but the area to the east of it is pretty notorious for doing big eruptions in this style (veidivotn, eldgja, skaftar fissure etc). Being only 8000 years old hekla probably has a big future ahead of it. Im assuming that last question will be answered in the part hekla will be in. I understand now why most of you find it such an interesting volcano. Hekla IS the result of rifting fissure eruptions. It’s only in the geologically recent that it has started trying to become more like a stratovolcano. At it’s core identity, it is an overgrown cone-row. As for the fascination with it? Well, that’s one. 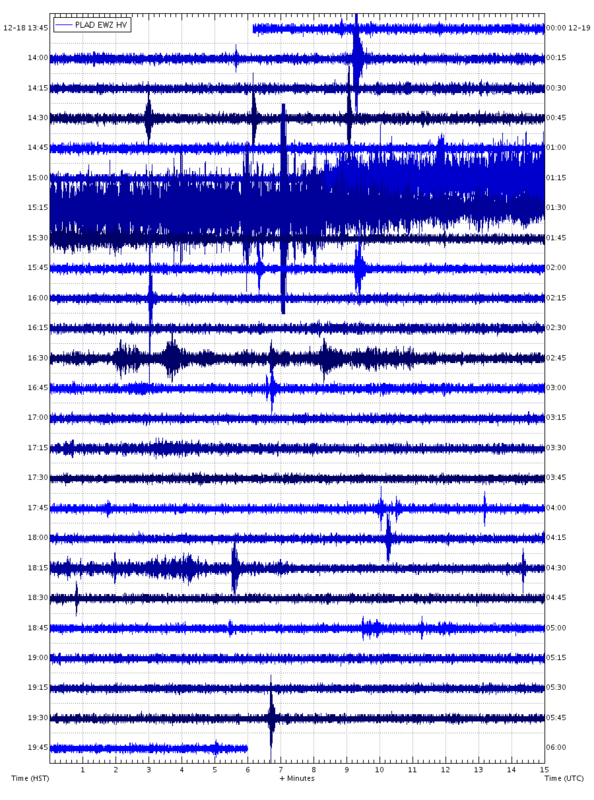 Another is that due to it’s core identity, it doesn’t quite follow the waking up methodology of stratovolcanoes. It can be quiet as a church mouse and go to full-on in just over an hour. Of course, now that the seismic system monitoring it has been upgraded, that may not hold true next time. It might give ample warning. But, to give you an idea… For the Hekla 2000 eruption, had you been standing on the summit, you may have felt the tremor in your feet about 15 minutes before the top of the mountain ripped open and magma was spewing skyward. With rifting fissure, I actually meant something on a much bigger scale comparable to the skaftar fires eruption, with active eruptions along the whole fissure swarm, not just on the mountain itself, with big lava flows to the south and west and possibly to the sea. I would imagine such an eruption would be even worse than the 1783 eruption because of the fluorine content of hekla lava. This might require a bit more evolution of the system though. I have one extra reason to be interested in hekla, its last eruption started on the same day I turned one year old. I think that those eruptions A) happened right after deglaciation and B) happened during times where there were not a preponderance of large central volcanoes with well developed fissure swarms that could divide the brunt of post-glacial magma production between them. If you would have tallied up the amount of lava expelled in the first 4000 years post de-glaciation and ejected it through one or two places you would get several very large hrauns on top of each other. This is though a bit speculative, but I think it is not far off the mark. Are the two eruptions that occurred near Eldeyarbodi in 1783 and 1830 part of Iceland or is that area part of the non-Icelandic MAR? That is debatable, I have here omitted Eldeyarbodi since they are quite a distance away from Eldey and Geirfuglasker. It is about 35 kilometers further out. So, it is far more debatable if it is a part of the EGVB than the RR. There is also the part that is visible in the bathymetric data, and that is that there is a depth discontinuity between Eldeyarbodi and what I describe as EGVB here. I have also appended this image to the article above. Eldeyarbodi is though definitely a part of Reykjanes Ridge, it is the belonging to EGVB that is dubious. As for the depth thing, that area looks like it’s right on the edge of the raised platform or whatever it’s called that surrounds Iceland. Well, I’ve answered my own question. The area is the same distance from the mainland as the southern tip of the Kolbeinsey Ridge. Explosion at Agung 23:32:32 . Double lightning on an ash cloud. Is this good news at Bardabunga? That would entirely depend on what you consider good news. In this case it means that the hydrothermal activity has increased inside the caldera and that the volcano is re-couperating nicely after the eruption. There is though no sign of an upcoming eruption at this moment. No new news about katla? It has calm down. Think it will be more quake action next year? I made a map with the movement of the GPS stations, presented by arrows. Please mind it is not an accurate visualization, it gives a trending direction only. Looking at the GPS graphs of the USGS website, the moving began about at 27th november and lastest only 3 or 4 days. De moving of the stations was about 15 to 20 mm in the direction presented by the arrows, also the downward movement was about 15 to 20 mm during this period. This all is not that spectacular…., but I think it is fun to see the volcano subside a little bit as a result of the eruption. Thinking of the inhabitants, this looks good. Not a constipated volcano. No caboom unless new feed from below. – Langjokull is not fully dormant. It has shown signs of awakening, but still little. I put it in a category above 1. There has been several swarms in the region, the one in Skjaldbreidur was just the last one. – Oraefajokull is, I think, at level 3. In fact, it is the only volcano with an active alert in Iceland, placed in yellow alert. Its giving signs it is not dormant anymore. I think it has at least 25% chance of an eruption within the next few years. – Hamarinn is also more active than it seems. It is estimated to have had several small subglacial eruptions (the last in 2011), and also glacial floods. So, its a bit more active than we think. Kverkfjoll is the same. It had a phreatic explosion some years ago, one or two ocasional dike intrusions, also a glacial flood. It is definitive not dormant anymore. It seems to be a very silent volcano, unlike Bardarbunga. And like most Vatnajokull volcanoes, they come back to life very quickly when you least expect them. I would put at 15% a change of seeing a dike SW of Bardarbunga causing a rifting event in that direction. Last one were in 1861 and 1477. – Westmannaeyjar can be downgraded to yellow. Like Krafla, the region was highly active in the 1970s, but it is now fully dormant, with only the odd earthquake every few months. I don´t expect an eruption in these systems. – You are very right to place Eldey at orange level. Its a volcano ignored by most but actually quite active and has had several swarms and intrusions in the past few years. I expect an eruption from this system in the next 10 or 20 years. – Snaefellsjokull is also more active than most know. When I lived in Iceland, I got to know of a study performed in that volcano that detected hundreds of earthquakes during one summer season, almost all of these were missed by the SIL network, because they were relatively small. Its probably the most neglected stratosvolcano in Iceland. – The 1226 eruption in Reykjanes was a large VEI4. Very ashy around Iceland, and created also large lava fields. And also large pumice rafts in the ocean. It must have been really large, for a standard Reykjanes eruption. That was the eruption that created Illahraun if I remember correctly. A repeat might just cause a right mess! Recalling the intrusion and possible failed eruption on the reykjanes peninsula earlier this year, is there anything showing from that area still? Or will that be answered in the next post? Will be answered, but nothing much is happening at the moment. Programing note. (not involving programing at all). 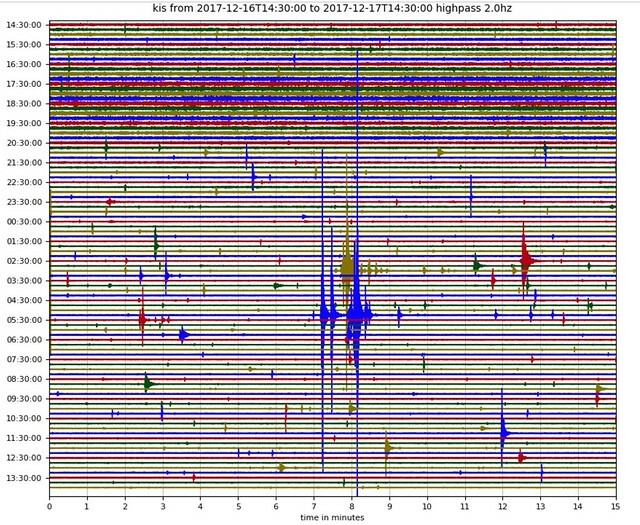 Via back channel discussion, it has become apparent that a full scale deflection on the Agung seismo, is roughly about the same power equivalent as a Mag 3.0 quake in the vicinity of the crater. This is NOT a hard and fast rule, and can change with out notice (From setting changes on the equipment etc.) You’ll notice full scale deflections as when the waveform starts clipping and has a flat top. I point this out so that ‘yall can roughly gauge the sizes of what you are seeing on the traces of the seismo. Lahar going on at Agung right now (15:10 local)? It’s been raining all day and something is completely drowning out the usual 5.7 and 6.5 Hz signals in the spectrogram. ^ Looks like ordinary cloud formation to me. That was a pretty good one. Shame about the cloud. If you scan back though, at the start of that episode, most of the steam/ash was coming from the LH side, right over the rim from the fumarole we’d been observing for a few days and a long way from the centre of past events. It’d be nice to see new drone footage of the crater. There’s another webcam – being run by some ham radio operator. More distant view, but interesting. Mute sound before viewing. Between 16:30 and 17:30 local time I counted four explosion, all from the same small area, close the centre of the mountain. I can’t tell whether it is ashy or steamy: water cloud in shade can look pretty dark too. There may have been one or more events during the last 15 minutes when cloud came in. During this time seismic activity was low, although the explosions are still being picked up. There has been a trend of decreasing seismic activity but increasing number of eruptive events. Maybe the intrusive episode and the degassing phase is really over (therefor lower seismic activity), and what we’re seeing now is just the effect of rain combining with hot and unstable lava. 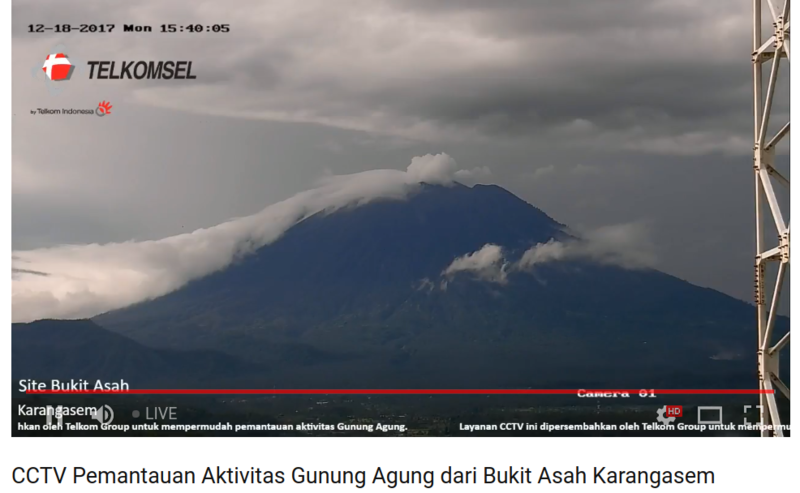 Nice timelapse 16-12 Agung, composed screen webcams and seimometer. After watching a couple of those time lapses, it is clear what the supposed new fumarole actually is. Remember that we believed that a part of the crater rim had collapsed during the continuous eruption? It turned out, as the action slowed down, that a portion of the rim closest to the cam is a bit lower, which made it look collapsed when the far side of the rim was obscured by the eruption column. The “fumarole” is in exactly the same location, which means that the steam that we see comes from the inside of the crater. I think it is simply increased steaming from the edge of the lava lake. Take a look at the video of the lava lake filmed from the rim and you see what I mean. So I went back to the previous article and checked the conversation. Turns out that Neil Law already had this idea, but then had second thoughts. Well, I feel confident that the steam comes from the inside of the crater. A suggestion: perhaps what we are seeing is a bit of physics. Note that the cloud seem to stream up towards the fumarole, not down away from it. Also note that the fumarole seems stronger when there is activity inside the crater. I am wondering whether we aren’t seeing the shower curtain effect. When you take a hot shower, the shower curtain bends inwards towards your feet. With a cold shower, it doesn’t. The reason is that the shower heats the air, hot air rises, and pulls in replacement air at the bottom. The crater is hot and causes the air above it to rise. The air is replaced from outside the crater. I think in this place the prevailing wind may allow the air to be sucked up through the cleft, towards the crater. As the air rises up the mountain, it cools and this causes the cloud to form. At this place at the cleft, it gets caught up in the hot caldera air and shoots up. Bingo – you got your fumarole. What changed my mind was seeing steam appearing to jet from the vent, a short way down the slope from the rim, tight and intensely white at the base, expanding as it went…. at an angle to both the face and the wind on the day. It was emerging as from a nozzle, and under a little pressure. Let’s go back to that drone footage. I think , from my observations, the fumarole (or not) is the pale patch at the bottom of the screen at the 22 second mark. It is clearly outside the crater, BUT it is also directly above a secondary vent….. Make of that what you will. Your fumarole is very serious today. Its looks like a cloud, but this is real fumarole. I would go with Albert’s view that a lot of what is observed is valley cloud, probably forming as a result of thermals created by the lava porridge in the crater, coupled with Tomas’ argument about our viewing perspective of the crater rim. A very clear/dry day would help confirm but not much chance of that at the mo. I have no doubt there will be plenty of small fumaroles around the rim. It is an erupting volcano, therefore there will be heated rocks for rain water to percolate down to and interact with, plus there will no doubt be some gases finding there way up from deep below. I would however be surprised to see a significant fumarole/new vent up near the rim. We have what appears to be an open system of some sort, so i would not expect to see something significant forcing it’s way to the surface near/above the level of the old crater floor as that would be going against gravity. Much further down the flanks would be a different matter…. We have considered the possibility of Agung going back to sleep (desirable) or it going kaboom (not desirable) but what is the likelihood that it carries on like this for an extended period i.e. years? Circled in green is the cleft feature and the arrow indicates the viewing direction from the Bukit cam. Curiously, it points straight at the steaming edge of the lava lake. Looking at the latest Bali priest video posted further down, it does seem to be steaming quite a lot. I also think Albert’s shower curtain effect plays a role here for the visual appearance. Hot air is definitely going to cause an updraft, and that air has to be taken from somewhere. I think the priest video might be shot from the point on the rim that is marked as a hindu temple on GE. I think we’re looking at different spots. I have no doubt that the location you point out is a cleft of some sort, but I believe the alleged fumarole is 90 degrees anti-clockwise from there, directly above the secondary vent… and further outside the crater. I mind about one on the south side, which started as a tiny, but precisely located source of steam on sunday. This is outside of the crater, and I think, it is not a shower curtain effect. That arrow points exactly to the spot that is circled on my screen grab. Rather than agreeing or disagreeing I want to see it again in daylight first. I just looking on yukize cam have figured out, that this is mirage, because part of north crater rim is visible above the south rim. So, there is not any fumarole outside the crater. Post updated with additional graphics and more detailed map. Everyone can suggest their favourite volcanic event for 2017. This might be a newer “priest climbs the summit of Agung” video, it was published today. Also the crater looks to be about 2/3 full. Here’s another one. These guys are crazy. You can hear the fear in their breathing, and with good reason. 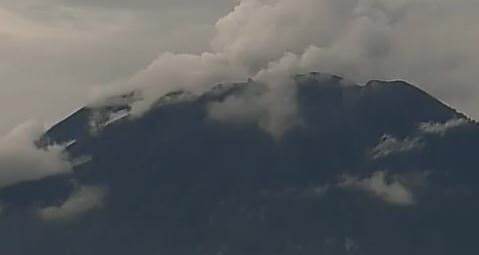 As if this eruption itself isn’t enough reason to not climb, people have just been killed in a landslide at Merapi, the site of the deadliest eruption of the 21st Century to date, and only 350 miles from Agung. Beyond idiotic. Finally a clear view of Klyucheskoy . 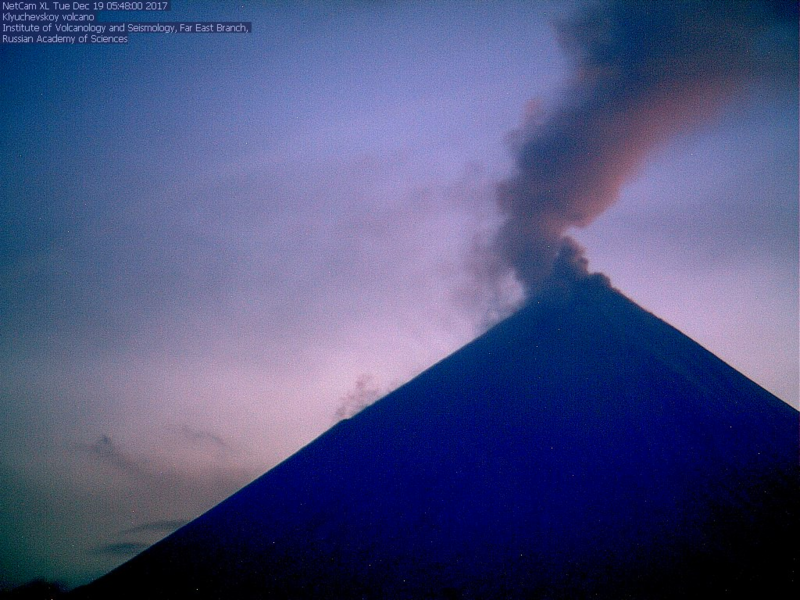 Still erupting, Still beautiful. 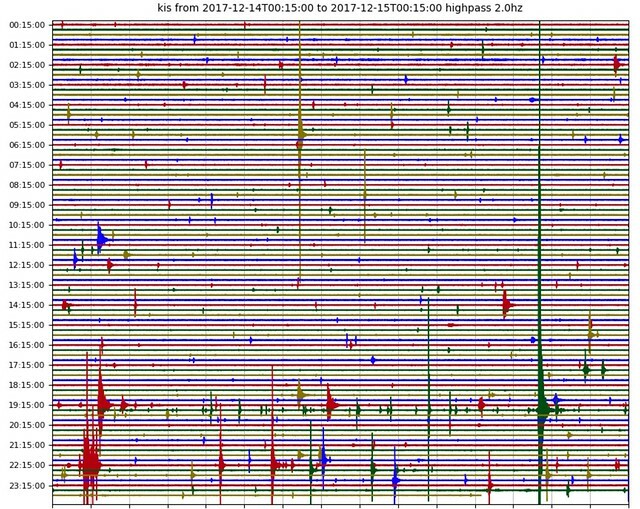 Another tremor on Mauna Loa? Good read Carl, Many thanks. A Q for you, or anyone else for that matter. Andrej’s first plot shows lots of EQ’s spread out over the Eurasian plate away from the MAR but hardly any on the NA plate. Why would that be? It is belived to have to do with the onset of immobilization of the NA plate. Ie, that it is moving comparatively less than the oceanic plate going towards the EA continent. Today Agung is like Iceland icecap volcano. It starts to be seen 09:44:26. Massive explosion at Bezymianny, ash to 50,000ft! Unfortunately you just linked to a video from one of the worst conspiracy nuts on the internet… Anyway it’s the largest explosive eruption since Sangeang Api 2 1/2 years ago, and Bezymianny’s biggest since 2006. I actually used to be sunscribed to dutchsinse on youtube (around the time holuhraun started and I was looking for videos of it) but only really because he was good at finding video footage quickly even if he tried to do pseudoscience with it. I left when he said the Americas were being pushed towards Europe by the pacific plate, the mid atlantic ridge is a collision zone, and that pangea was therefore entirely impossible, within 30 seconds……….. So did I. I actually fell for some of his “theories” at one point, until the conspiracy levels went through the roof! For Bezymianny, an FL500 plume is 1913.45m³/s mass ejection rate. Well the volume probably isnt huge, but that mushroom cloud is. Last minute entry to Erik’s contest maybe. 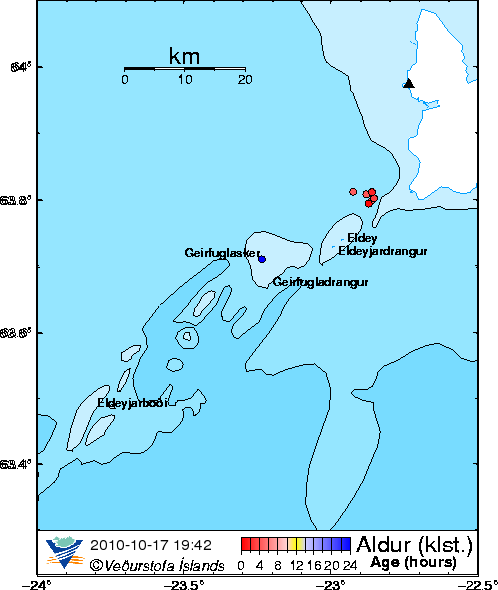 And two quakes at Bardarbunga, quite shallow, , with several foreshocks and a swarm of aftershocks. Carl better hurry with the Mammoth – Bardarbunga might beat him to it. 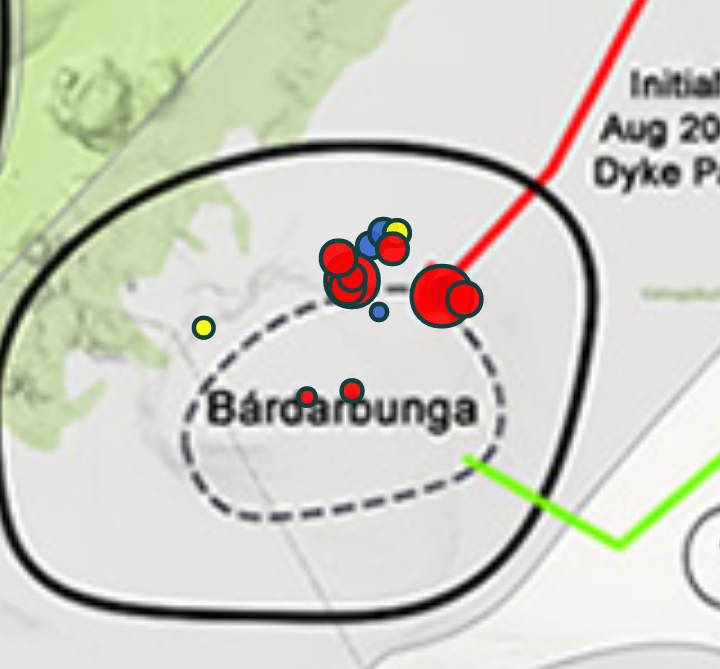 Are the quakes around bardarbunga the same sort of deep recharge quakes that happened before holuhraun? The deeper ones that is. I have this feeling that something will happen there at least before 2020, and maybe sooner rather than later. Low frequency… Very shallow.. Magma sneeking up between caldera wall and THE PLUG? What goes down must go up…..continued re-inflation, my guess is this will go on for years and there is a good chance that it blows a seam somewhere else to relieve the pressure before anything happens in the caldera. Why I think this…. if nothing blew up during the massive release of energy before, this is tiny in proportion and doubt much will happen. Next major quakes on the south side will follow within days, its becoming very predictable. 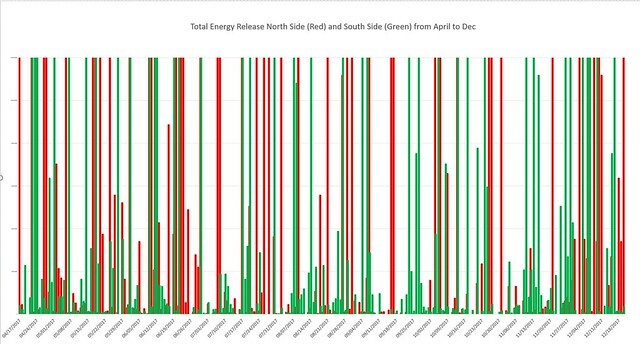 You can see the alternating bands Red & Green of north side energy release and then south side energy release. Notice that sometimes it anternates and sometimes it overlaps. Looks convincing. Really beautiful data presentation. Supports the plug moving kind of zigzag. However, considering the plate spreading, there could also be a weaknes developing somwhere along the caldera wall. Will be interesting to follow this. I was also convinced about the pairwise appearance of larger quakes on the north and south part of the caldera rim, so I tried to do some nice plots to correlate the time between events in order to prove the point. I was quite surprised to find out that I couldn’t find such a correlation. Instead, the north and south side appear to have their own rates of energy release, with the south side being a bit slower between events. They are however quite regular, so they will align from time to time and that is what we tend to notice. I think upward movement of the plug acts as a pressure release, so rather than inflating like a balloon and then popping like Grimsvötn, Bárðarbunga will continue to fill up until it either leaks out through the ring fault, in a small eruption, or builds up enough to feed a new Holuhraun type eruption. It would be really interesting to see radar measurements of the caldera floor to see what it is really up to. The south side quakes release less total energy. This I believe is due to the angle of the ring faults, the south being inward dipping and the north outward. Yes, I totally agree on that. If a new holuhraun-type big eruption happens it will probably be in a completely different spot to where holuhraun is. Im somewhat inclined to believe that if it has another large eruption it would be southwest along the veidivotn fissure zone, or between bardarbunga and the small glacier next to it (I think the area is called ‘vonskard’ or something like that). I think there was an eruption in that area in 1860 or something like that and it looks like it might have been pretty big looking at the length of its lava flow (30 km on google earth). And then you also have the 1477 eruption which was significantly bigger than the 2014-2015 eruption. The lower rate in the south was also the case during the Holuraun eruption, when the movement was in the opposite way. That argues against the angle of the dip being the reason for the slower south. At that time there was a clear relation, where the total energy release was fairly constant but peaks in one side were matched by dips on the other. Maybe there is shallow magma in the south/southwest part that leaked into the fault in 2014 and means some of it can slide smoothly. Or maybe it has something to do with that direction pointing towards veidivotn and the dead zone so it is hotter on that side. North side is allowing huge mass of rock to fall and release potential energy. That image is very much what my mental picture of the situation looks like. I think it makes sense. Some behind the scenes work will be taking place this morning meaning that some users may have issues contacting the site, should you be locked out or unable to access the site, please contact us through the Facebook group, Twitter or e-mail. So is the “I am human” button the sheep/dalek/vc equivalent of “Multi-pass”? It is actually there to catch out the sheep and daleks. Daleks are particularly worrisome. They are always stirring up trouble. The sheep? Just keep ’em away from the cliffs. I remember having read Haroun Tazieff talking about a friend of him working at the Aerospatiale…. He was studying the dynamics of the flaming gas from rocket nozzle, and told him the only difference was on a volcano, the nozzle was pointing up…. That, kicks arse!! It’s also about the closest view anyone will get of the business end of volcano being festive. Dukono is currently lofting a FL 070 plume. (0.02 m³/s DRE ejection) Dunno what it was during this video. Very much reminds me of the Thermite reaction. Grey and calm one second, then whoosh! 🙂 we never grow up I guess? With a delay of about 1.241 seconds for the audio, I estimate that the camera is about 411.2 meters from the vent. Probably telephoto, likely on a tripod.